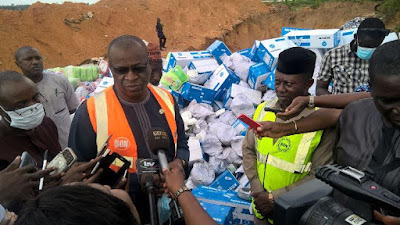 The Director-General, Osita Aboloma, said the shops and warehouse had products described as “unwholesome” and risky for human consumption. Abolama said the products were smuggled into the country without registration numbers, adding the goods were injurious to human health. He disclosed that the raid was as a result of intelligence reports from other security agencies that are in cooperation with the organization. He said, “the seized products do not meet our standard specifications, a critical part of which is the regulation on fortification with Vitamin A.
Aboloma was particularly worried about the presence of unfortified pasta, flour and sugar in the country, adding that they were not good for human consumption. Represented by the Deputy Director, Market Surveillance, Suleiman Issa, the DG said SON was carrying out a campaign to do away with substandard imported sugar, flour and flour products in the country.